Easter is both a religious and cultural celebration that has been celebrated for centuries across the globe. 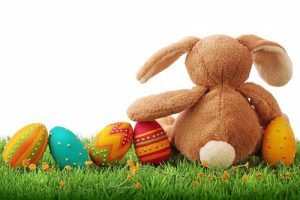 In North America, Easter is also synonymous with the arrival of spring; the legend of the Easter Bunny is thought to have originated as early as the 19th century and served as a symbol of new life and renewal. One of the advantages that comes with Good Friday and the warmer spring weather is an overall elevation in mood, as people look forward to spending more time outside as well as having an extra day off work to spend with their friends and family. Bring in some Easter-themed treats for the office like chocolate eggs or hot cross buns. Play Easter trivia and award the winner with an Easter basket full of fruit, chocolate, and gift certificates. Decorate the office with Easter or spring-themed decorations. Organize an Easter-egg hunt and invite employees to bring their families to participate. Bring in some new plants or fresh spring flowers to brighten up the office. Celebrating this popular holiday with your employees is a great way to show them your appreciation for their daily efforts, and will keep overall engagement high as we kick off the second quarter of 2017!